The very first glimpse and the very last impression of Vancouver Island for millions of residents and tourists is a beautiful little lagoon as they hurry to and from the Swartz Bay ferry terminal in North Saanich, along the Trans-Canada highway. The lagoon is obscured by an unsightly thicket of Scotch broom which – for once – has a useful purpose in maintaining the tranquility, protecting a rare intertidal plant community and limiting disturbance of the winter-resident Green-winged Teal. There is no indication that we are looking at the historical area of Wsi – ikem ( or Tsehum), the original home of the Coast Salish people, and that we are also looking at one of the oldest wildlife sanctuaries on the Pacific Coast, the final stomping grounds of one of Canada’s most notorious naturalist, John Macoun. 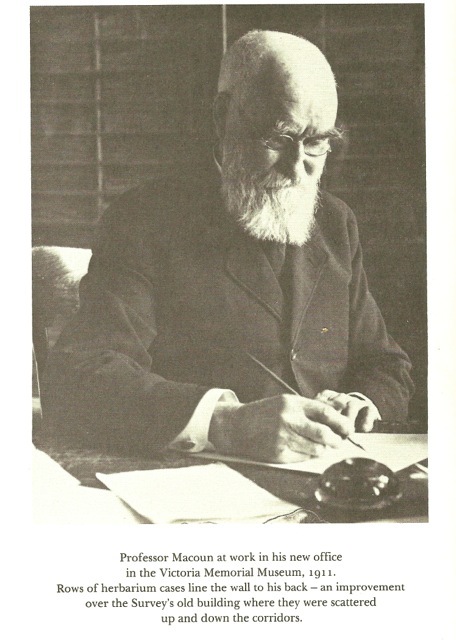 When the “Professor”, John Macoun, Chief Botanist of the National Museum, retired to Sidney in 1912, he was one of the most renowned scientific figures in Canada, famous for his botanical explorations of the prairies and his dismissal of Palliser’s Triangle as an obstacle to the settlement of the prairies. He was a naturalist in the old sense, self-taught, alert to all life. He and his son, James, had just completed the first Catalogue of Canadian Birds, a monumental task, but the indefatigable Professor had no intention of retiring. At age 81, his life as a free naturalist had just begun, in the paradise of W’Saanich and Wsi-ikem (Tsehum). Within a year of his official retirement, he had collected and documented for science 247 species of fungi, 128 species of lichen, 31 species of liverworts, 700 species of flowering plants, and 195 of the known 264 species of island seaweed. In 1914, he wrote “ I mean to commence a more extensive system of field work.” and when he suffered a stroke that paralyzed his right arm, he taught himself to write with his left hand, and continued to document the local flora of the Saanich peninsula. Unfortunately Professor Macoun was unable to complete his list. It ends at specimen 265, Linaria cymbalaria, Ivy, “ a casual garden escape” (now known as a terrible invasive species), collected on June 28th. On July 18th he died peacefully in his sleep in his ninetieth year. He was buried in Patricia Bay Cemetery, but his body was later disinterred and removed to Ottawa for national recognition. John Macoun was responsible for establishing the first migratory bird sanctuary in North America. Last Mountain Lake Sanctuary in Saskatchewan was established in 1887 as a result of his work. Macoun’s initiative led to the establishment of a network of sanctuaries across the country and made Canada a leader in signing the terms of the Migratory BIrds Convention Act of 1916. In recognition of this legacy Shoal Harbour Migratory Bird Sanctuary was established in 1931 by an Order-in-Council of the Canadian government.